Whispers in the Loggia: "I Am Sorry"
Well known for his energetic preaching style, prayerful spirit and pastoral savvy -- his recent letter on the economic crisis was, after all, highlighted by the Vatican newspaper -- Bishop David Zubik of Pittsburgh is taking Lent's call for repentance to a new level at the helm of his hometown church. We know that the Church as the Body of Christ is divine. But we also know that the Church is also very human. We also know that over the years the Church in its humanness has been the cause of harm or pain to some of the faithful. It has happened anywhere in the world. It has happened in our diocese. This harm could have been from anyone representing the Church. That certainly includes me by my actions or inaction. Just last weekend at the conclusion of a very joyful celebration of the installation of a new pastor, a very kind and honest man told me how hurt he was that he had not received a response to a letter he had sent me some months ago. I asked him about the purpose of his letter. As he shared a very serious family concern which occasioned the letter, I had no recollection of the matter nor any recollection that the letter ever arrived. But that really didn’t matter as much as the fact that the writer was hurt. He felt ignored, even rejected. And while it does not appear that his letter even arrived, I regretted his hurt. Unfortunately, I am sure there were times where my actions or words were the cause of hurt! Unfortunately, I am sure that there were times where actions or words by others who represent the Church were the cause of hurt! Were you ever hurt by a brusque or sarcastic comment from a leader in the Church? Have you stayed away from the Sacrament of Penance because some priest decades ago “yelled” at you in Confession? Was there some disagreement while employed with the Church that unjustly ended with you losing your job? Were you in any way, in any way, harmed by any representative of the Church? Did you feel picked on by a teacher in one of our religious education classes or in one of our schools? Because representatives of the Church and I have been responsible for hurting others, I will be leading a special Service of Apology, a Service of Prayer, on Tuesday of Holy Week, April, 7, 2009, at 7:00 p.m. at Saint Paul Cathedral in Oakland for anyone who has been hurt or harmed in any way by the Church. It is a moment for me as Shepherd of this local Church to say those three very important but oft forgotten words “I am sorry” and in so doing to seek forgiveness of anyone hurt by the Church. The invitation is genuine. No reservations required. No tickets distributed. If you have been harmed by the Church in any way, I invite you to come. There will be nothing expected of you but your presence and your willingness to pray with me. No one will bother you. All that I ask is that you and I open our hearts to the grace of forgiveness. In our lives, we experience two wonderful moments. The first is that great moment when we realize the forgiveness of God. It is that moment when we understand—truly understand—that God will forgive. It is in that moment of freedom from sin that we know how real are the words of absolution in the Sacrament of Penance. The second wonderful moment is when we can forgive. It is that great moment of letting go, of forgiving those who have harmed us, forgiving the sins of the past so that we can live for the future. Holy Week is the culmination of our Lenten pilgrimage. In our Lenten journey, we focus on prayer, fasting and good works. We do so in reparation and atonement for our sins in preparation for Easter. Throughout this Lenten season, I am blessed again to be leading the special Penance services for all of our deaneries. It is so inspiring for me to see the large numbers of faithful from every corner of this diocese coming together to seek God’s inexhaustible forgiveness in the Sacrament of Penance celebrated together with so many of our brother priests. As an extension of these deanery events, the Service of Apology will be a time for me to express my sorrow and apology for sins committed in the name of the Church. It will be a time for me to seek forgiveness—a time for all of us gathered in prayer—to exercise compassion and to seek reconciliation. When we forgive and are forgiven, then we are healed. And when we are healed, we are healthy, strong and able to truly celebrate Easter, able to live the mission that God has designed for each of us. Healed, we can even more so be the Church Alive! I want our Church and its people to be as strong as possible. This is why I am committed to honor the instruction of Jesus that we ask for forgiveness. As we pray in the “Our Father,” “forgive us our trespasses as we forgive those who trespass against us,” we ask forgiveness of God as we ask His help to forgive others. Forgiving, forgiveness, are the cornerstones of living out the faith every day of our lives. Please come to Saint Paul Cathedral on April 7. I eagerly look forward to gathering in prayer for what I hope will be a time of healing. representative of the Church and her leaders or me, your bishop. may your love make one again. may your power heal and strengthen. may your Spirit raise to life. With interviews, a video report comes from the Burgh's ABC affiliate, WTAE. The bishop held a similar service in his prior post as bishop of Green Bay. Speaking of the Steel City, earlier this week the residence of its bishops for the last half-century formally went on the block. On his homecoming in late 2006, the 12th bishop declined the 11 bedroom, six-bath Edwardian Tudor -- a bequest to the diocese in 1949 -- choosing to make his home instead alongside the diocese's future priests at St Paul Seminary (where, so it's said, he serves as the de facto rector). 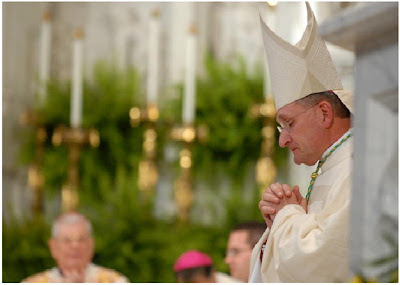 Late on the night of his appointment to the Pittsburgh post, Zubik told 'TAE in an interview that the church needed to move away from being "attached to buildings." Asking price for the Gilded Age manse: $2.5 million.